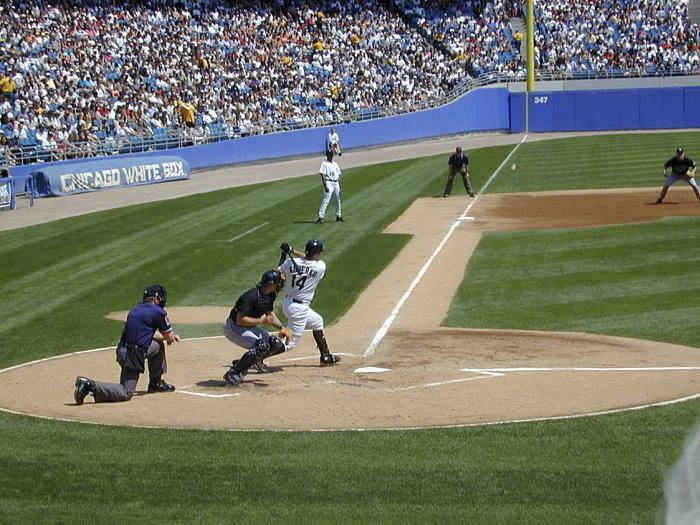 The rivalry between the Cubs and the White Sox is legendary, as are the traditions that give each team its unique persona. For Chicago baseball newbies, here’s a guide to little-known traditions, fascinating facts, and pre- and post-game places to sleep and party (not necessarily in that order). The Cubs are an easy team to love—frequent underdogs, playing home games at iconic, ivy-covered Wrigley Field, the oldest National League ballpark in the country. Most notably, the Cubs won the 2016 World Series, thus ending a 108-year World Series championship drought that many had pegged a bona-fide curse. Dating from 1937, any game win for the Cubs at their home field is marked with the hoisting of a white flag adorned with a giant blue “W”. When Cubs players congratulate one another on the field and fans cheer in the stands, you’ll hear Steve Goodman’s 1984 tune, “Go Cubs Go!” blaring across the airwaves. Whether you love it or loathe it, it’s become the Cubs official victory song. Wrigley Field is the only major league baseball park with ivy on the outfield walls, planted by Cubs President William Veeck in 1937. If a ball gets caught in the ivy and the outfielder raises his hand signaling his failure to find it, it’s an automatic ground rule double. But if the defender tries to get the ball out of the ivy, no ground rule double will be ruled. A unique characteristic of Wrigley Field is the presence of tall residential buildings behind the stadium with a view onto the ballpark. Many of the rooftops offer tickets with food and beverages during home games; revenues are shared with the Cubs. 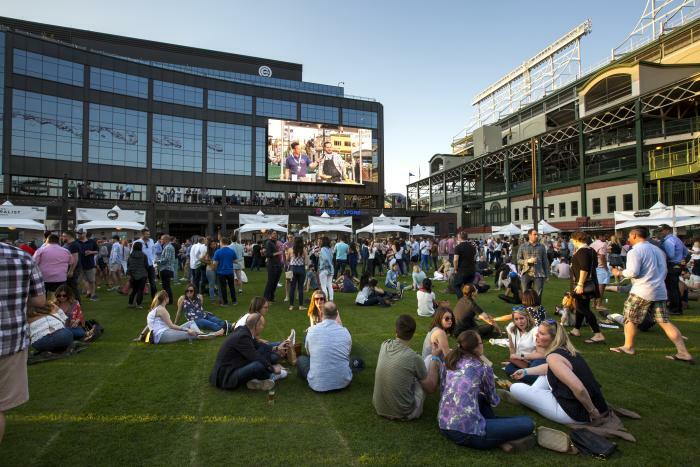 On game days, ticketholders head to the Gallagher Way (formerly The Park at Wrigley) to lounge in the sun, drink local brews and watch game highlights on a giant video board. They also get the chance to glimpse the 2016 Championship Trophy at the Trophy Room, which houses World Series collectibles. The tavern-style Brickhouse and Starbucks Reserve® Bar welcome both ticketholders and non-ticketholders, as do the tantalizing food trucks that line the area on game days. Check out the Cubs 2018 Season and ticket options here. Boutique: Majestic Hotel A fire-lit lobby, newly renovated public areas and bold décor give the air of an English estate at this boutique 52-room hotel in East Lakeview. Budget: Wrigley Hostel You’ll find a lounge and BBQ deck; kitchen; common room with pool table, ping pong table, foosball, a BYOB bar, large flat-screen TV, and tons of games; computer room; and free breakfast, WIFI and lockers—all within a stone’s throw of Wrigley Field. Traditional: Hawthorne Terrace, a Best Western Plus Hotel Nestled in vibrant Lakeview East, you’ll feel a part of the neighborhood at this charming, award-winning hotel, which features a variety of packages, including Bleachers or Bust! (enjoy two bleacher seat tickets to a Cubs game, a $20 ballpark concessions gift card, and complimentary breakfast). 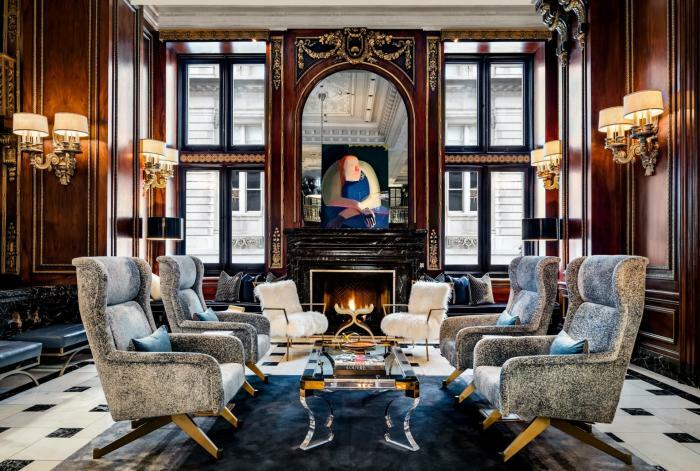 New: Hotel Zachary at Gallagher Way Inspired by the designs of world-renowned Wrigley Field architect and Chicagoan Zachary Taylor Davis, this new kid on the block stands across the street from Wrigley Field, promising an authentic neighborhood experience. The hotel includes Chicago favorites Big Star, West Town Bakery and Smoke Daddy. Reservations accepted beginning April 2018. The Wheelhouse Hotel A boutique hotel with "warehouse modern decor," retail space and restaurants, The Wheelhouse Hotel’s name references the batter&apos;s strike zone favored for a surefire home run. Start booking this spring. 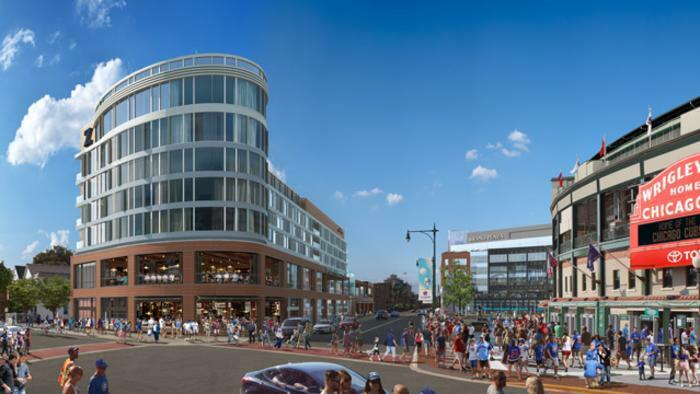 Wrigley Field may not have a parking lot to tailgate in, but it’s got something even better—the whole of the party-centric Wrigleyville neighborhood surrounding it. Here are a few among the sea of sports bars favored by diehard Cubs fans. This is the classic corner bar across the street from Wrigley Field, complete with rooftop. You can’t miss it—hoards of fans crowd around it, whether or not its game day. The party continues at Sports Corner, a bi-level bar across from Wrigley Field. An American pub menu, TVs lining the walls and contagious Cubs fever make it a favorite among baseball fans. Spacious, warm and inviting, this Irish-influenced gastropub hosts six full bars, 30 plasma screens, an outdoor patio (with retractable roof in case of rain), a VIP lounge and rooftop garden. The name tells you everything you need to know: Batting cage, skeeball, arcade games, dueling pianos, and two floors with fully stocked bars. Over the years, the team has adopted some of rock’s legendary songs, most notably AC/DC’s “Thunderstruck” as the game gets ready to start. Journey’s “Don’t Stop Believin&apos;” became the 2005 team’s unofficial anthem, with Journey singer Steve Perry showing up at the World Series parade to belt out the tune with team members. A single shower stall stands in left field, once the sobering-up spot for drunk, sweaty fans, and now a welcome cool-off destination for kids and tailgaters. Speaking of tailgaters…unlike Wrigley Field, Guaranteed Rate Field isn’t surrounded by bars as far as the eye can see. Which means pre-party culture is alive and well and tailgating is part and parcel of the White Sox experience. The party generally gets started two hours ahead of game time. The White Sox have a rich Cuban tradition reflected in its players, sports history…and elevated ballpark menu. The Cuban Comet Sandwich, specifically, is named for the late, great outfielder and coach Minnie Minoso. It’s a hot-pressed sandwich containing sliced ham, Mexican-style shredded pork barbacoa, Swiss cheese, mustard, sliced pickles, and plenty of garlic-and-citrus mojo sauce. Check out the White Sox 2018 Season and ticket options here. B&B: Wheeler Mansion If stately, historic charm is your thing, head to the Wheeler Mansion, a tranquil urban estate located steps from the McCormick Convention Center, Michigan Avenue shopping and Lake Michigan. Traditional: Hyatt Regency McCormick Place This 4-Star Hyatt has Lake Michigan as its backdrop and provides easy access to waterfront trails, Guaranteed Rate Field, the Museum Campus, and more. Luxury: The Blackstone With a museum-quality art collection, this storied architectural icon offers modern accommodations with views of Lake Michigan and Grant Park, dining at its acclaimed Mercat a la Planxa restaurant, craft cocktailing and entertainment at Timothy’s Hutch and little luxuries like turndown service, the 1600 CLUB Lounge and more. New: Marriott Marquis Chicago This four-star hotel close to McCormick Place made its grand debut on the Chicago skyline in September 2017. The hotel spans 40 stories overlooking Lake Michigan, downtown Chicago and the South Loop. 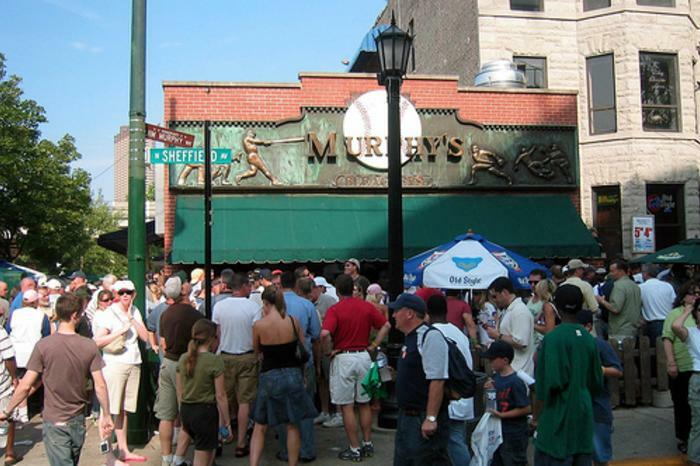 Whether or not you’re tailgating, for the full White Sox experience, head to one of these iconic bars pre- or post game (or both). A couple of blocks from the stadium, Sox fans flock to this Bridgeport bar to drink beer and indulge in Irish fare (Guinness and Irish Egg Rolls!). The venue hosts live music after every Sox home game. Turtle’s lies mere steps from Guaranteed Rate Field, and is the perfect spot to indulge in homemade appetizers, sandwiches, salads and pastas. Check the chalkboard for specials and pick your ideal seat indoors or outdoors. Pre- and post game, head to Guaranteed Rate Field’s very own ChiSox Bar & Grill, a lively hangout where you’ll enjoy drinks, pub grub, flat-screen TVs for miles, and a fair bit of memorabilia. Located at Gate 5, the newest offering from the White Sox and Gibsons Restaurant Group is open for every White Sox home game. Also, the Sox recently announced their partnership with Chicago&apos;s own Revolution Brewing, which will be featured as the "Beer of the Homestand" during the Detroit and Boston series on May 26 through May 31. Not only that, but the Revolution Brewing #SoxSocial Tap Room will take up residence along the left field line, serving up rotating Revolution craft brews, such as "Hero" IPAs and imperial oatmeal stout. The pop-up will operate for two seasons. Part liquor store, part neighborhood tavern, and the whole enchilada when it comes to great experiences. Maria’s boasts a large rotating menu of bites, rare craft beers, and signature cocktails. It’s a little further afield than the rest of the venues mentioned here, but definitely worth the trip, especially given its recent expansion. New features include a Warped Space Beer Hall, front and back patios, and Kimski, a counter-service concept, highlighting Korean Polish Street food, helmed by Chef Won Kim. Multi-award-winning writer Judy Giannetto heralds from the United Kingdom but has made Chicago her home for the last 30 years. Having traveled throughout the world and written about the cultural fabric of cities far and wide, she revels in the dynamic Chicago scene, and in particular its ethnic diversity and vibrant arts culture.